Next time I visit Biltmore, I'll make sure to check out this tea room. I enjoyed seeing the photos. Now I stopped there for dessert once but I'd love to go for tea! That looks just to good and lots of fun. oh, yum, thanks for sharing. 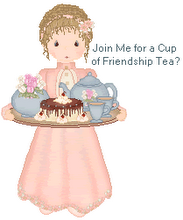 Maybe on our way from Wisconsin to Hilton Head Island for Easter week, Hon and I can stop there for a cuppa!